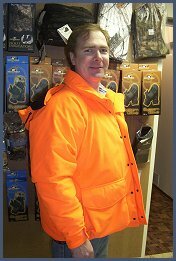 Join our team of Arctic Shield dealers selling quality hunting accessories, apparel and outdoor workwear across Canada. It's easy to get started and the interest you will receive is fantastic. We have over 30 Arctic Shield dealers throughout Canada, offering customers the finest in "Complete Body Warming System" products. We are proud of our camo clothing including Hunting Jackets, Gloves and Pants available in camouflage fabrics with our exclusive RE-tain technology, designed to keep you warm regardless of temperature or windchill. This is a Great Opportunity! If you are an outdoor sports store or would like to start your own home based business with little investment required, contact us today! NEW: We are developing a dealer training program and benefits for those who sign up will include our new Visa/Mastercard merchant package. Q: What is the Size of the Apparel Industry? A: In 2001, the Canadian apparel industry comprised of approximately 3914 establishments and employed about 93 000 workers. The market for Canadian apparel reached some $9.9 billion in 2001, an increase of 3% from the previous year, with domestic shipments accounting for $4.0 billion (41%) and imports of $5.9 billion (59%). At retail, Canadian consumers spent almost $18.6 billion for apparel in Canada in 2001. Q: What do Canadian consumers spend annually for clothing? A: At retail, Canadian consumers spent almost $18.6 billion for apparel in Canada in 2001. Q: What is the current market trend for apparel? A: Underlying changes in demographics, lifestyle, incomes and prices continue to exert changes on overall consumer demand, and apparel consumer spending. The Canadian apparel market reached some $9.9 billion in 2001, an increase of 3% from the previous year, with domestic shipments accounting for $4.0 billion (41%) and imports for $5.9 billion (59%). In the five year period of 1996-‘01, the market rose a noticeable 49%, moving up from $6.7 billion in 1996 to $9.9 billion in 2001. Canadian apparel retail consumption in 2001 was $18.6 billion.